This is the time of year many prospects as well as customers begin to evaluate their water garden product line and services offered. So, how much do you know about your distributor competition? You remember the saying keep your friends close but your enemies closer, well this does not have to suggest the entire competition pool is your enemy, but rather see it as companies you wish to keep in your mind and learn from. Good or bad, knowing your competition and the water feature products they offer will help you see the value in your selected products. We look at the PondBuilder water garden brand comparatively to other water feature brands and realize we have similar pond equipment offerings, but very distinct differences in pond filter and equipment details. 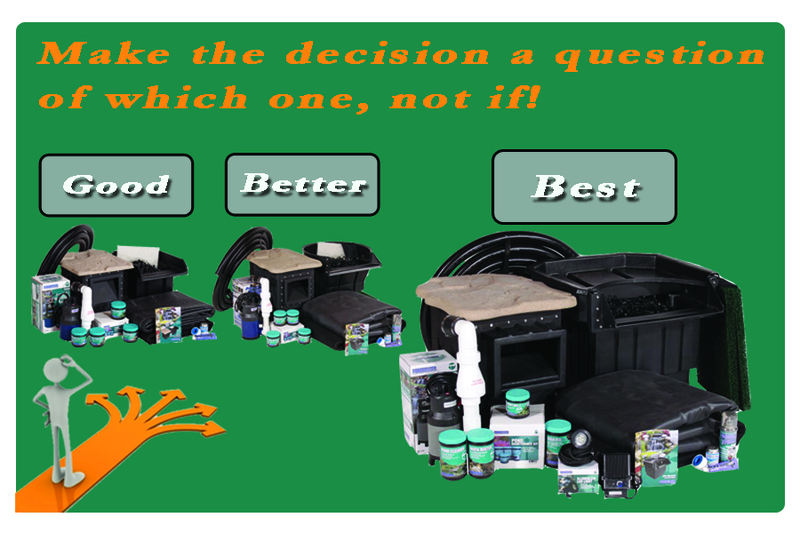 PondBuilder differentiates itself through the product line as it offers GOOD \ BETTER \ BEST or Elite and DiY quality pond supplies. By having a tiered offering the PondBuilder brand remains part of the customer buying process despite pricing and keeps the focus on which water garden kit best fits the project, not if the water garden brand is capable of such an offering and at a fair price. This is an important customer tip. Evaluate if your products on the shelf give your customers choices of which one vs. if at all. You may be amazed at how well you differ or how much you need to improve depending on the level in which you differentiate from your competition. Understanding that a competitor's limitations are your best opportunities will help you succeed. Take a look at the following ways to help improve the way in which you offset your business and services. 1. Make your services more noticeable: What about your company and where do you best represent what it is that you do? 2. Bring your differentiating details to light: Use comparison charts, testing, and key promissory statements to stand out. 3. Engage customers in a unique manner: Incorporate your own newsletter, eBlast, or monthly reward program built around your best offerings. 4. Train your staff toward excellence: Communication skills are key to B2B and B2C business. A simple hello, but in your own unique verbiage will go a long way on how a customer will perceive the quality of your service. PondBuilder challenges their water garden distributors to take your company a step further down the differentiation road this season. Stand out away from local merchants and definitely the online market place by highlighting the degree in which your services make you the best business to work with. This is a marketing and sales idea you will find needs attention each season.